Indigestion is a gastroenterology condition which can seriously impact the life of the sufferer. You will find it difficult to eat certain foods without tasting them again hours later. There are ways to avoid indigestion and treat the condition when it is frequent and reoccurring. In most cases, simply avoiding the foods that trigger indigestion is enough to avoid episodes. However, in other cases, a combination of approaches is necessary in order to find relief. Dr. Yamini may recommend changes to your diet, including eating a few small meals throughout the day rather than the three traditional meals. Alcohol and caffeine can trigger indigestion, so reducing your intake of those substances may help. If you take medications such as naproxen, ibuprofen or aspirin, Dr. Yamini can discuss alternatives that are not linked to indigestion. What are the Symptoms of Dyspepsia? Dyspepsia is another name for indigestion and can present with a number of common symptoms. Each symptom alone can make life miserable for patients who suffer from severe dyspepsia. 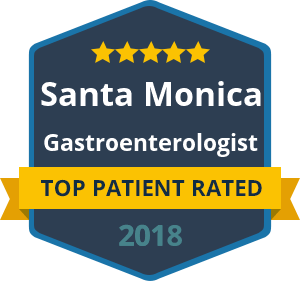 Combined, symptoms are often impossible for the patient to tolerate, and it’s at this point that they typically seek consultation with a specialist such as Dr. Yamini. Early fullness is one of the symptoms of dyspepsia that often goes unnoticed. If you struggle to finish a meal when you have only taken a few mouthfuls or bites, you may be experiencing indigestion. You may also experience a similar symptom of uncomfortable fullness after a meal. Burning and bloating in the upper abdomen are symptoms that are usually experienced in combination, although either is a potential sign of indigestion. Nausea is another common symptom of indigestion that results in feeling the need to vomit. Dr. Yamini can help you manage the symptoms of indigestion as well as investigating any potential underlying cause. Contact our practice today to book a consultation.